Providing linear reviews with contract-native reviewers can be costly. In this webinar, we’ll discuss how you can reduce costs by utilizing the analytical ability of these reviewers and training machines to translate the majority of your documents — culling down the content so fewer contract reviewers are needed. Pete Afrasiabi, the President of iQwest, has been aggregating technology-assisted business processes into organizations for almost three decades, specifically in the litigation support industry for 18 years. He works on projects involving machine translation (over 100 million documents processed), managed services and ediscovery. Pete has deep knowledge of business processes and project management, and extensive experience working with c-level executives. Mark Hjerpe is a Partner at Divergent Translations, where he serves as a trusted member of global investigation and ediscovery working groups, providing expertise and guidance on navigating the linguistic and logistic challenges of multilingual review and translation in international matters. Over the past 20 years, Mark has played a pioneering role in the growth of the global language services and technology industry. He has lived and worked in Latin America, Asia and Europe, developing best practices in translation management and streamlining multilingual workflows for global law firms and corporations. Scott Reents, the Lead Attorney, Data Analytics and E-Discovery at Cravath, Swaine & Moore LLP, focuses on data analytics and ediscovery, advising clients on defensible approaches to the preservation, collection, search and analysis of digital evidence, including the use of advanced technologies such as technology assisted review (TAR). He has represented numerous Fortune 100 companies and major financial institutions in securities litigations, shareholder class actions, bankruptcy-related litigation and other complex commercial disputes in various federal and state courts. Scott is a frequent speaker and writer on data analytics and ediscovery, including ediscovery litigation, TAR and advanced search analytics, the defensibility of ediscovery processes, information governance and ediscovery ethics. Michael Wise is an Associate in the litigation practice at Paul Hastings, focusing on antitrust and competition issues. He has represented clients seeking merger and acquisition approval under the Hart-Scott-Rodino Act and in negotiating and responding to civil investigative demands and subpoenas from the DOJ and FTC, handled complex litigation under the Sherman Act and state unfair competition laws, and counsels clients on compliance issues, including developing compliance policies and assisting with internal audits. In international transactions, Michael has successfully coordinated merger control filings for the European Commission and other foreign regulators. He is familiar with a wide range of technology platforms, document review options and management strategies that can expedite timelines and minimize costs. In 2014, 2015 and 2016, Super Lawyers named Michael a Rising Star in antitrust litigation. If you are a Compliance Officer, Litigator or Company Executive that works with large populations of foreign language documents or are contemplating a merger with a multi-national company that will deal with these types of documents, this article is for you. This is not a marketing publication. It delves into the details of how your organization can benefit from a technology that until now has been elusive and often fails when others try to execute on a strategy of maintaining control or reducing the population of documents that are within their infrastructures. At the end of this article you will also learn how you can utilize our services to establish such a solution within your organization. Whether you manage your organization’s Ediscovery needs, are a litigator working with multi-national corporations or are a Compliance officer, you commonly work with multilingual document collections. If you are an executive that needs to know everything about your organization, you would have a triage strategy helping you get to the right information ASAP. If the document count is over 50-100k you typically employ native speaking reviewers to perform a linear one by one review of documents or utilize various search mechanisms to help you in this endeavor or both. What you may find is that most documents being reviewed by these expensive reviewers is often irrelevant or requires an expert to review. If the population includes documents from 3 or more languages, then the task becomes even more difficult! There is a better solution. A solution that if used wisely can benefit your organization, save time/money and a huge amount of headache. I am proposing that in these document populations the first thing you need to do is eliminate non-relevant documents and if they are in a foreign language you need to see an accurate translation of the document. In this article you will learn in detail how to improve quality of these translations using machines at a cost of hundreds of times less than human translation and naturally much faster. With the advent of new machine translation technologies comes the challenge of proving its efficacy in various industries. Historically MT has been looked at not only inferior but as something to avoid. Unfortunately, the stigma that comes with this technology is not necessarily far from the truth. Adding to that, the incorrect methods utilized in presenting its capabilities by various vendors has led to its demise in active use across most industries. The general feeling is “if we can human translate them, why use an inferior method” and that is true for the most part, except that human translation is very expensive, especially when the subject matter is more than a few hundred documents. So is there really a compromise? Is there a point where we can rely on MT to complement existing human translations? The goal of this article is to look under the hood of these technologies and provide a defensible argument for how MT can be super charged with human translations. Human being’s innate ability to analyze content provides an opportunity to help and aid some of these machine learning technologies. An attempt to transfer that human based analytical information into a training model for these technologies can provide translation results that are dramatically improved. Machine Translation technologies are based on dictionaries, translation memories and some rules based grammar that differs from one software solution to another. Although there are newer technologies that utilize statistical analysis and mathematical algorithms to construct these rules and have been available for the past several years, unfortunately individuals that have the core competencies to utilize these technologies are few and far between. On top of that, these software solutions are not by themselves the whole solution and just a part of a larger process that entails understanding language translation and how to utilize various aspects of each language and features of each of the software solutions. I have personally witnessed most if not all the various technologies utilized in MT and about 5 years ago, developed a methodology that has proven itself in real life situations as well. Below is a link to a case study on a regulatory matter that I worked on. If followed correctly, these instructions can turn machine translated documents into documents with minimal post editing requirements and at a cost of hundreds of times less than human translation. They will also look more closely like their human translated counterparts with proper flow of sentence and grammatical accuracy, far beyond the raw machine translated documents. I have referred to this methodology as “Enhanced Machine Translation”, still not human translation but much improved from where we have been till now. To understand the nuances of language translation we first must standardize our understanding of the simplest components within most if not all languages. I have provided a summary of what this may look like below. Simply accepting that this base of understanding is common amongst most if not all languages is important, since the model we will build on makes assumptions that these building blocks will provide a solid foundation for any solution that we propose. Furthermore, familiarity with various classes of technologies available is also important, with a clear understanding of each technology solution’s pros and cons. I have included a basic summary below. Now that we understand what is available, building a model and process that takes advantage of benefits of various technologies, while minimizing the disadvantages of them would be crucial. In order to enhance any and all of these solution’s capabilities, it is important to understand that machines and machine learning by itself cannot be the only mechanism we build our processes on. This is where human translations come into the picture. If there was some way to utilize the natural ability of human translators to analyze content and build out a foundation for our solutions, would we be able improve on the resulting translations? The answer is a resounding yes! To understand how we would accomplish this, we need to review some of the machine based concept analysis terminologies first. In a nutshell these definitions and solutions are what we have actually based our solutions on. I have made reference to some of the most important of these definitions below. I have also enhanced these definitions with how as linguists and technologists we will utilize them in building out the “Enhanced Machine Translation” (EMT for short) solutions. N-Grams: N-Grams are the basic co-occurrence of multiple words that are within any context. We will build these N-Grams from the summarization stage earlier and create a spreadsheet with each depicting each N-Gram and their raw machine translated counterparts. The spreadsheet is built into a voting worksheet that allows human translators to analyze each line and provide feedback as to the correct translations and even whether certain N-Grams captured should be part of the final training seed data or not. This seed data will fine tune the algorithms built out in the next stage down to the context level and with human input. A basic depiction of this spreadsheet is shown below. Simultaneously human translate the source documents that generated these N-Grams. The human translation stage will build out a number of document pairs with the original content in the original language in one document and the human translated English version in another document. These will be imported into a statistical and analytical model to build the basic algorithms. By incorporating these human translated documents into the statistical translation engine training, the engine will discover word co-occurrences and their relations to the sentences they appear in as well as discovering variations of terms as they appear in different sentences. They will be further fine-tuned with the results of the N-Gram extraction and translation performed by human translators. Define and/or extract key names and titles of key individuals. This stage is crucial and usually the simplest information to gather, since most if not all parties involved already have references in email addresses, company org charts, etc. that can be gathered easily. Once a basic training model has been built we would test machine translate original representative documents and compare with their human translated counterparts. This stage can be accomplished with as little as less than one hundred documents to prove the efficacy of this process. This is why we refer to this stage as the “Pilot” stage. Repeat the same steps with a larger subset of documents to build a larger training model and to prove the overall process is fruitful and can be utilized to machine translate the entire document corpus. We refer to this stage as the “Proof of Concept” stage and it is the final stage. We would then start staging the entirety of the documents subject to this process in a “Batch Process” stage. In summary, we are building a foundation based on human intellect and analytical abilities to perform the final translations. In using an analogy of a large building, the representative documents and their human translated counterparts (pairs) serve as the concrete foundation and steel beams, the N-Grams serve as the building blocks in between the steel beams and the key names and titles of individuals serve as the facia of the building. Naturally we are not looking to replace human translation completely and in cases where certified human translations are necessary (Regulatory compliance, court submitted documents, etc.) we will still rely heavily on this aspect of the solution. Although the overall time and expense to complete a large-scale translation project is reduced by hundreds of times. 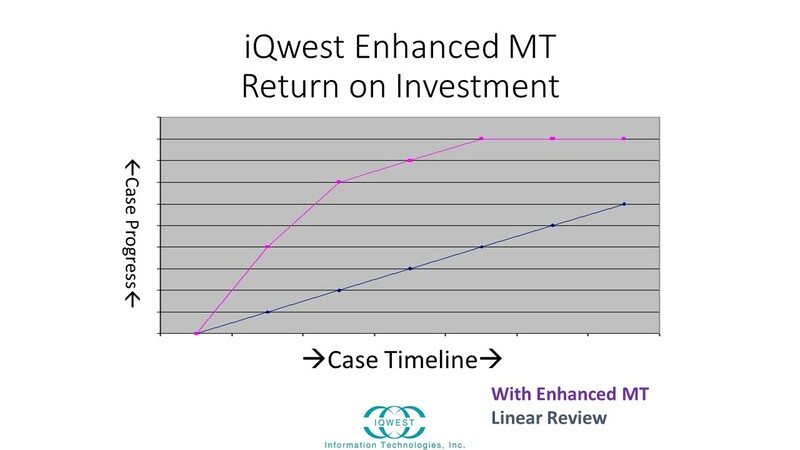 The following chart depicts the ROI of a case on a time scale to help understand the impact such a process can have. This process has additional benefits as well. Imagine for a moment a document production with over 2 Million of Korean language documents that were produced over a long-time scale and from various locations across the world. Your organization has a choice of either reviewing every single document and classifying them into various categories utilizing native Korean native reviewers or utilize an Enhanced Machine Translation process to provide a larger contingent of English speaking reviewers to search and eliminate non-relevant and classify the remainder of the documents. One industry that this solution offers immense benefits is in the Electronic Discovery & litigation support industry, where majority of attorneys that are experts in various fields are English speaking attorneys and by utilizing these resources along with elaborate searching mechanisms (Boolean, Stemming, Concept Search, etc.) in English they can quickly reduce the population of documents. On the other hand, if the law firm relied only on native speaking human reviewers, a crew of 10 expert attorney reviewers, each reviewing 50 documents per hour (4000 documents per day on an 8-hour shift) would take them 500 working days to complete the review, which each charging hourly rates that can add up very quickly. 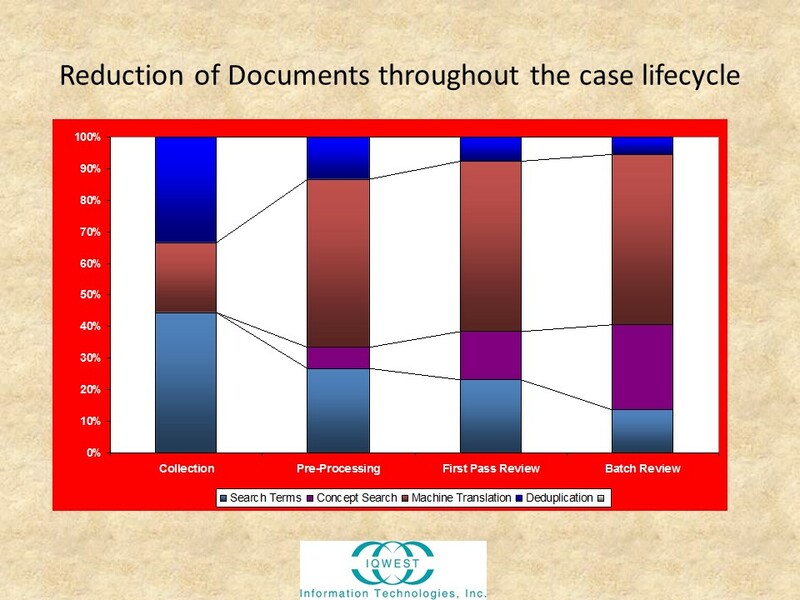 We have constructed a chart from data over the past 15 years performing this type of work for some of the largest law firms around the world that shows the impact of a proper document reduction or classification strategy may have at every stage of their litigation. Please note the bars start from the bottom to top, with MT being the brown shaded area. The difference is stark and if proper care is not given to implementation it often prevents organizations from knowing the content of documents within their control or supervision. This becomes a real issue with Compliance Officers that must rely on knowing every communication that occurs or has occurred within their organization at any given time. We have been providing electronic discovery, managed services and consulting to AMLAW100 firms and large organizations throughout the technology, pharmaceutical, manufacturing and other industries for almost 2 decades. We can provide your organization with the proper know-how of establishing this solution internally as well as provide EMT services on a contractual basis. Since we work with many law firms and deal with many documents that are confidential and mostly court protected, we can provide assurances as to the non-disclosure of any information through contractual agreements. We are also looking to expand our know-how in this core competency and are exploring partnering up with organizations that can help us scale up our capabilities into newer industries. In summary, we are a smaller organization with a niche that can benefit the larger organizations. Mr. Pete Afrasiabi the President of iQwest, is a veteran of aggregating technology assisted business processes into organizations for almost 3 decades and in the litigation support industry for 18. He has been involved with projects involving MT (over 100 million documents processed), Manages Services and Ediscovery since the inception of the company as well as deployment of technology solutions (CRM, Email, Infrastructure, etc.) across large enterprises prior to that. He has a deep knowledge of business processes, project management and extensive experience working with C-Level executives.